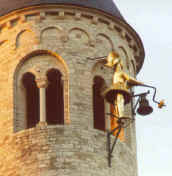 The south tower of the Collegiate Church of Nivelles is adorned with a little warrior 8 feet high (2.08 metres), dressed in a suit of gilded copper and armed with a hammer. He weighs 350 kilos, and is called Jean de Nivelles. This mechanical man should not be seen as a historical or legendary hero, or as a memorial: he is simply a local jacquemart. In times gone by, from the top of public buildings, a watchman would signal the approach of enemies, outbreak of fires, etc and before the advent of clocks, would call the hour. It is quite probable that the man of metal was made bearing in mind that watchman. Jean de Nivelles was born around 1400. He had first been placed on the tower of the town hall, which stood on the lower part of the Grand -place and for the period of his duty there, he is not named in the texts. In 1525, he is "the man who strikes the hour" and in 1535, "the copper man". The indications are that he was named only on his transfer to the south tower of the Collegiate church in 1617. Why was our jacquemart called "Jean de Nivelles"? But the legend goes thus! In the 15th century, a French nobleman, Jean de Montmorency, lord of Nivelle (Nevele in Flanders), eldest son of Jean II de Motmorency, refused to march against the Duke of Burgundy, despite orders from his father. His ignoring every summons gave rise to the popular saying " he's like that dog of a Jean de Nivelles who runs away whenever you call". This character became the subject of many popular songs, and during the 17th century their success led to a confusion with the jacquemart of Nivelles (with an -s) ,the name and the saying became transferred, and he was even given a dog as attribute! Jean de Nivelles struck the hour until the beginning of the 18th century, when in 1702, a clock with four large faces was mounted on the central tower of the Collegiate church. From then on, the big bell in the tower rang the hours and Jean only the half-hours, tapping with his hammer on a bell at his side. On Shrove Tuesday 1859, lightning started a fire which ravaged the Collegiate church. Jean survived, though immobilised and deprived of carillon and mechanism. On the 29th August 1926, the carillon was restored and a new mechanism enabled him to return to duty. May 1940, a new disaster: Nivelles is bombed by the German air force. The Collegiate Church is severely damaged, the main tower collapses....but Jean is miraculously spared and clings on resolutely to 'his' tower. For four years, he flouts the occupying forces and on the morning of the Belgian National Day, 21st July 1944, he is the bearer of the Belgian flag! Unfortunately, on the 3rd September, during the last skirmishes for the liberation of the town, he is shot, struck by bullets in the helmet, head and body. Today, restored and re-gilded, he gleams at the top of his tower and a new carillon plays his tune on the hour and half hour. Imbued with memories of the past he watches over the town, a living symbol of the old spirit of Nivelles and its lusty humour.